The last few days have been turning more autumnal; cooler days peppered with heavy rain showers. As this week coincides with the end of the school Summer holidays it has seemed there has been a definite shift of season. 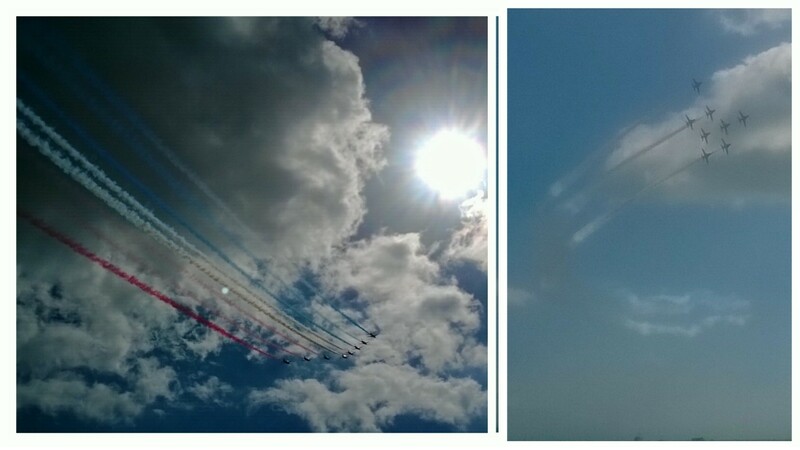 However as one last treat of Summer, we have had a rare hot and sunny day today, one last hurrah, the perfect day to go to the Air Show. In addition to the Red Arrows, there were lots more aviation opportunities at the festival. We went inside a grounded Chinook helicopter and had a good look around, the children went into the cockpit and then imagined parachuting out the back. There was also another excellent acrobatic display but for me the most moving spectacle was the fly past of a Lancaster Bomber and a Spitfire, planes with so much history and tradition. The soundtrack only added to the event and it felt emotional and poignant, a privilege to see such important planes. Today really was the perfect end to the Summer holidays, a happy family day.